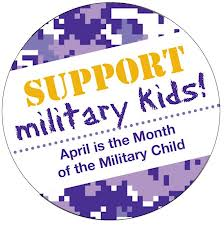 I have heard from countless sources that April is the "month of the military child," dubbed by the National Military Family Association. (woops, I realize it's now MAY! How did that happen?) I have also seen countless poems and pictures to depict this gracious month, and it's bittersweet, to say the least. I am far too familiar with how these little ones feel.. Growing up as an Army brat, I experienced something all too the same. With a total of 8 school transfers throughout my academia by the time I graduated high school (yes, you read that right - eight different schools), not to mention having to make friends and leave friends through the most trying years, say right before and in the midst of that teenage angst of adolescence, and a few deployments here and there, I'm a little familiar, to say the least, of what these youngsters are going through. It's a different perspective, for sure. Growing up with my dad in the Army vs. my husband being a Marine, there are so many differences (relationship, branch, etc). I know there are so many other military spouse bloggers I have had the privilege of meeting or reading about (can I say I still "met" you if I just read about your life online? ), and they can all attest to the difficulties and experiences that this life brings. But sometimes, we forgot about others who also make a sacrifice, but in different ways: the children. 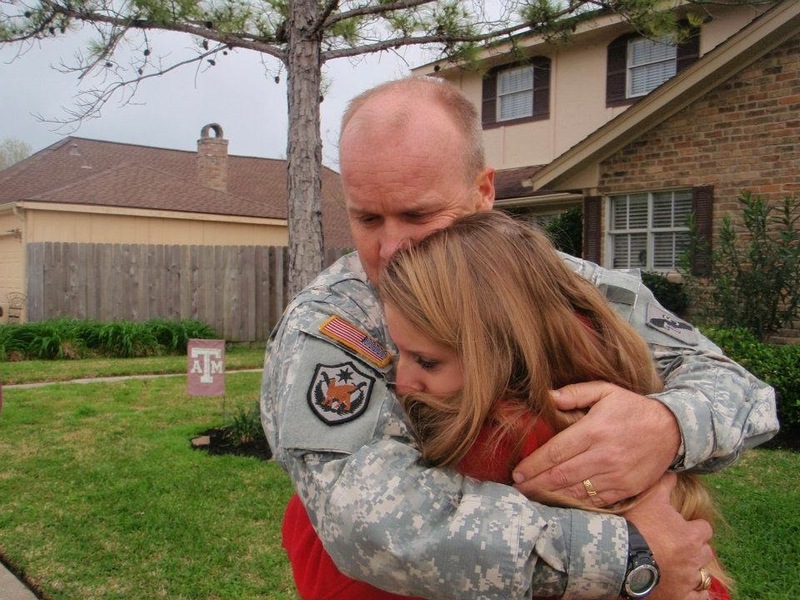 When thinking about military life, perhaps a lot of times we only think of the spouse at home. But there are children, too. So many military families. We must not forget about them. Now I understand that my background is quite different. Basically we moved quite a few times before I am really big enough to remember, then we moved a few more times and I went to 4 different elementary schools in those years. Then we moved in the middle of middle school - not a good idea, y'all, but with orders I know there's nothing you can do to change that! Moving from the south to the Midwest was a huge adjustment, but we did it. Then we moved again in the middle of high school - also, not a good idea! You can imagine how devastated I was on both moves, well sort of, because the last move we were moving back to our homeland - Texas! So I guess that made up for it! (My brother lucked out through the years - no splitting schools! One middle school, one high school, period). first military move to Virginia; My dad went in to work late after. I know that my little moving background has a lot more stability in it than others, though. And I truly do feel blessed - because for the majority, we were living near some base in Texas. It was only during that teenage angst that we were living in the Midwest, and any move other than that was really when I was too little to take much notice, really. But it does add up, and does make an impact on you. Overall, I feel truly blessed to have lived that life. I saw much more of the country than so many other families do - just because we had to drive across it to get from point A to point B. So many people I knew growing up, or even now for that matter, have never made it out of their home state, or even hometowns. I just can't imagine that! This fact alone is a huge blessing to be in this life - the guaranteed traveling you will be able to do! But know that there is so much more to it than that. Since this post is kind of late, I guess I can end it there. But I found these pictures via the EFMP Facebook page (Exceptional Family Member Program) and thought they were all to relevant to share. I especially love this poem, written by a 6th grader, no less! I love the quote - "I'm a child of the world, I bloom anywhere" What a fantastic way to think of this kind of life. Growing up, making friendships, and just figuring out life when you're young is enough battle as it is - add to that moving and military life (parents gone periodically, etc) - and you got yourself one fighter of a kid. One who doesn't necessarily have roots, but makes the most of where she is planted or moved to. And does anyone else notice the last couple of lines? Families are kind of like the backbone of the military; married or not, children or not, everyone has a family back home waiting for them. Families keep these guys going strong. So to say that military families "have your back" is kind of true in so many ways, and is really a fun way to think about it. Only a child could come up with these words. 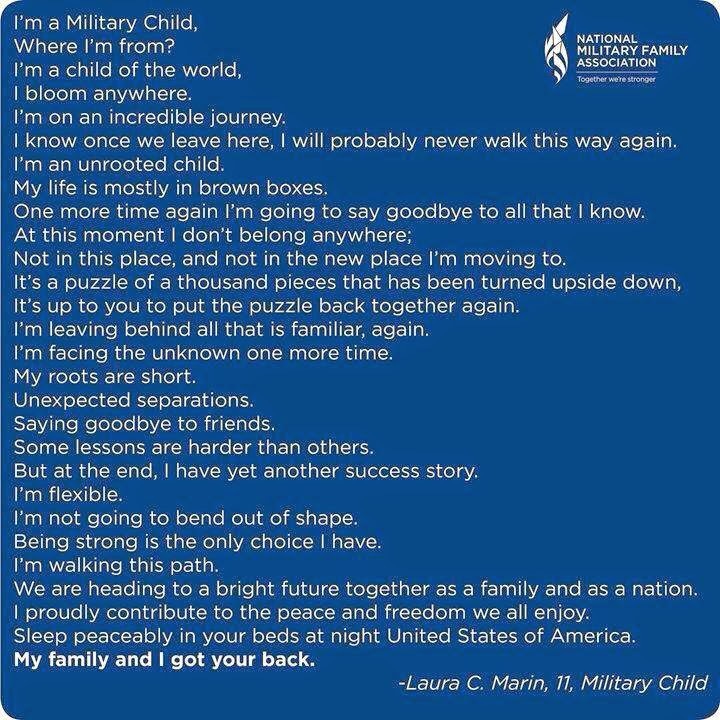 Seriously y'all, this poem captures the essence, in ways, of growing up as a military child. You don't really have roots - I was born in Kentucky, but haven't been back since I was 4. Home is where you live, or if you want to be more specific, where your parents are from. Home is where the heart is. So next time you are out and about, be sure to think of those who serve. And never forget about the family - they serve, too, but in different ways on the home front. Don't forget about the sacrifices the family members have to make - especially those military kids - with this kind of life. It is truly a blessing, and I honestly couldn't see my childhood any other way. I loved growing up with my dad in the Army - so many opportunities I wouldn't have been able to experience otherwise. Yes, deployments are hard, especially as children, but we can make it through. We are proud to live the military life, and it is an incredible feeling, when you think about it. When I look back on my childhood - the many schools and moves, and the times my dad was gone- I honestly wouldn't want to change a thing. I couldn't see it any other way. I loved going to new places, and when I finally opened up, meeting new people. The goodbyes aren't fun, but the homecomings are thrilling, and so exciting. This life background has made me who I am today, and has really been a blessing. 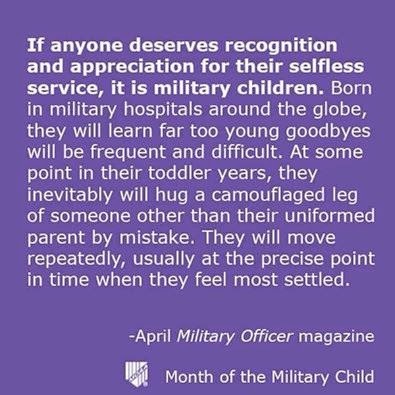 My heart goes out to military children! Going through a deployment is hard as a wife, but I can only imagine as a child! Happy Military Spouse Day too! The Time Is HERE! Etsy Paint shop NOW OPEN!